In search of a visually and acoustically appealing and affordable fretless bass I came across the Wishbass „lobe“ – model, I fell in love with immediately! Its design and basic woodwork comes from the luthier Stephen T. Wishnevsky from Winston-Salem NC (North Carolina / USA) and they´re all handmade. Wishbass’s Lobe is a singlecut fretless electric bass with a neck-through neck. The string alignment is string-through. A special feature of all Wishbasses is in contrast to the nowadays usually very flat eg. JB necks a thick neck which owns a thickness making a trussrod (truss rod) obsolete. A conceptual comparison with the neck of a double bass is obvious. The woods used range from feather-light Spalted Maple to Cedar (cedar) and Walnut (nut) to Ipe or Snakewood, extremely heavy but also extremely exquisite and attractive wood species. These woods are used in the sense of sustainability with all their characteristic peculiarities, this may also involve branch and / or wormholes or cracks on the surface. But this also means that no bass looks exactly like another one – neither in shape or width, length, weight, neck thickness, choice of wood, etc. 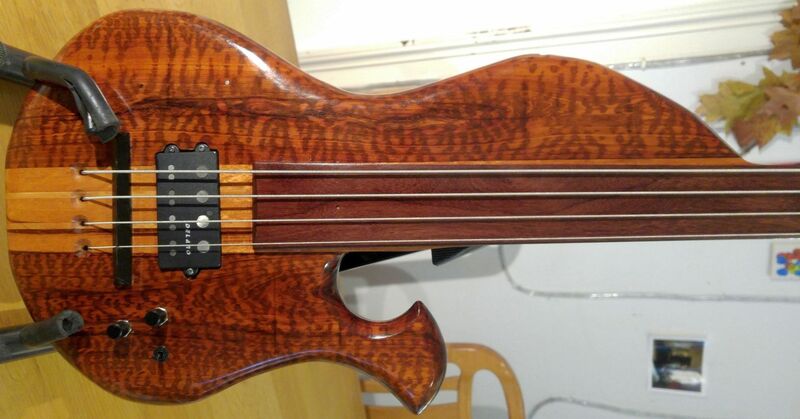 – they´re all absolutely unique handmade fretless bass.